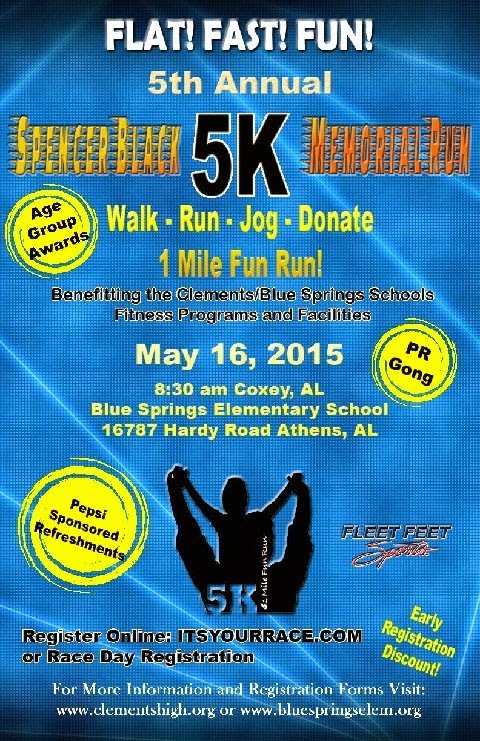 The Spencer Black memorial 5k will be Saturday, May 16 at Blue Springs Elementary at 8:30 AM. This race is a very fun event and the finish is on the track. When this race started, there was no track, and one of the goals was to help raise funds to build a track for Limestone County schools to use. Success! Last year, the race had to be rescheduled due to the tornadoes that ravaged the Coxey community and even did some damage to Blue Springs Elementary School. I've run this race several times in the past, and I've enjoyed it every single time! If you prefer, you can download a printable entry form and mail it in. Cost is $20 before May 2 and $25 after that.